A one-on-one appointment with your physician’s RN early during your first trimester. We will give you an overview of your pregnancy care at Sparks & Favor, discuss recommendations for a healthy start to your pregnancy, and answer your questions. We will also suggest some topics that you will want to consider as your pregnancy progresses. A follow-up appointment later in your second trimester (usually at your 28-week appointment) will give you an opportunity to discuss your concerns in more detail and share your preferences with us. At this appointment, we will know a lot more about the progress of your pregnancy. We will be able to help you tailor your birth plan to your individual medical needs and wishes. What support persons—partner, another family member, or other individual–will share your childbirth experience? What comfort measures do you think you will choose? Do you plan to breastfeed (and more)? You do not need to have answers yet, but your thoughts will shape your eventual birth plan. 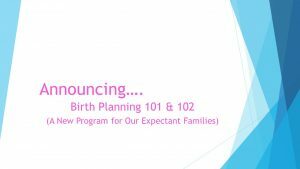 See our Birth Planning resources page! Above all, your RN has your entire pregnancy record. She will be able to help you consider these choices with attention to any special risks and needs we may have discovered during your pregnancy. As a group, our RNs have years of experience in prenatal care and labor and delivery. They are passionate about providing the support every new mom expects and deserves. Your primary doctor’s RN has shared your excitement at your first visit, talked with you on the phone, and gotten to know you over the course of your pregnancy. Who can better help you consider these choices than the care team you are most familiar with? Providing this counselling during your regular prenatal appointments is convenient and time-saving for busy expectant mothers and their partners. We are offering this program as part of your comprehensive pregnancy care at Sparks & Favor. There is no extra charge for your Birth Planning 101 and 102 visits. In greater Birmingham, many support resources are available to expectant parents through your insurance company, hospital, health department, and other providers. But we hope you will find our new program the most convenient, reliable, and relaxed path to the information you need. Your comfort and a healthy outcome for you and your baby are our mutual goal. We also want to support the choices that comprise your unique childbirth experience. On that special day–your baby’s birthday–many choices are yours alone.